This blog post is a first hand description of a volunteer's first day supporting the NYC Hurricane Service Center. 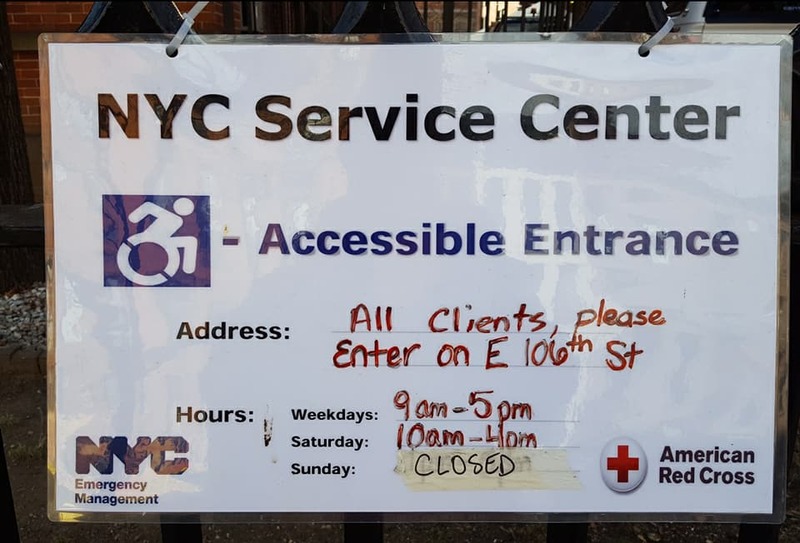 Since October, the American Red Cross has supported the service center opened by New York City to connect displaced individuals and families from Puerto Rico, Texas, Florida, the U.S. Virgin Islands and other Caribbean islands following recent hurricanes with critical services. The center is located at the Julia De Burgos Latino Cultural Center located at 1680 Lexington Avenue in Manhattan. For more information on the center, please call 311. In late November, I had my first experience as a volunteer with the American Red Cross in the Greater New York Region. In the months leading to this day, I applied to be a volunteer, went through the initial orientation, a background check, and then the full day boot camp training. I spent my first day volunteering at the Service Center organized by the New York City Emergency Management Office. At the Center, various agencies and nonprofits, including the Red Cross, the Salvation Army, Catholic Charities, Medicaid, NYC Legal Aid, and the NYC Department of Education and others, sponsored information tables to assist residents arriving from from Puerto Rico and the U.S. Virgin Islands due to Hurricane Maria. The room of the Service Center was bustling with people, including many young families with children, and some who had arrived at JFK Airport from San Juan only hours earlier. To the untrained observer, the operation might seem chaotic, but it was actually a very organized process. Visitors first sign in at the front desk and receive a checklist of all the programs in the room. They then go from table to table listening and learning how each program could be of service, and what benefits they may be eligible for as United States citizens. For families with school aged children, a consultation with staff from the Department of Education was a must. At the Salvation Army table, visitors could apply for a clothing voucher. The Center was well staffed with many Spanish-speaking interpreters who were happy to assist with translation needs. At the Red Cross table, Stephanie, our Red Cross supervisor of the day, gave us assignments and made sure we each had 30 minutes for lunch. We had two computers set up for visitors to register with FEMA, or if they previously registered, to check on the progress of their request for financial assistance. My fellow volunteer, Peter and Avina, taught me how to register people with FEMA. By the afternoon -- and 30 questions later -- I was able to sign up new enrollees by myself. The process got complicated if, for example, a visitor had previously registered, but forgot his or her password or PIN. Deborah, the Red Cross nurse on staff that day, was busy examining visitors who needed medical attention or had questions about medication. Several of the people I met that day told me of their worry about not having their needed medication due to their homes being destroyed and the lack of medical attention available throughout Puerto Rico. Volunteers Jose, Maureen, and Sarah were in charge of distributing clothing, diapers, baby formula and toiletries to those in need. When visitors checked in at our table, each was asked a series of questions so we could determine how to best help them. If our volunteers didn’t have something visitors needed or we didn’t have an answer to a question, we found someone in the room that could help. The stories of the visitors that day were heart wrenching. People literally arrived in that center with the clothes on their back. Many were living in shelters for the past six weeks in Puerto Rico under dire conditions and were relieved to finally be in New York to start over. Some were staying with immediate family; others had to stay at a makeshift city shelter by JFK. Still others needed shelter right that moment since a temporary living arrangement was indeed temporary. Housing seemed to be the greatest immediate need of most visitors, especially for the families with children. There was one story heard that day that I won’t soon forget. One young lady arrived earlier that day on a flight from San Juan. She came into the center with a distant cousin who lived in New York. She told me that in the rural part of Puerto Rico where she and her mother had a home, only a few had power by way of generators, and there was very little medical or health care available. Her neighbors relied on local good Samaritans providing sporadic water and food. There were always lines and waiting for some kind of help to arrive. This young lady was the primary caretaker of her mother who had Parkinsons disease and she had not taken any kind of medication in several weeks. Hurricane Maria ruined their home left her mom in a constant anxious state living in a temporary shelter. On the advice of local authorities, she left her mom temporarily with a family friend and came to New York to secure a bed in a nursing facility that could treat her Parkinsons. She knew that Medicaid was the primary funder of patients in nursing homes who were indigent. This lady broke down in tears saying she felt terribly guilty for leaving her mom, but in the long run, being cared for in skilled nursing facility in the United States would be the best long-term plan. So, she came to New York City in search of help. We signed her up with FEMA, we took her to our nurse since she seemed so stressed out. She stopped by Catholic Charities to apply for some temporary aid and then I escorted her to the Medicaid table where she spent an hour meeting with the representatives and applying for Medicaid. I couldn’t give her kind of answer except to say, “Keep calling, keep emailing, and keep reminding people of your mother’s desperate situation.” I wish I had better words of encouragement to share, but I couldn’t think of anything better to say. By the afternoon, I was getting a better idea of what services various agencies offered. For some visitors to the Red Cross table, after registering them with FEMA, I would walk them to another table and explain how this program could better assist them with specific needs. It seemed that every worker at the center couldn’t do enough to help the new arrivals to our city. The first day was a real education for me. There was so much I didn’t know, but everyone I met patiently explained how their programs worked, and who might be eligible. I look forward to returning to the Service Center in the weeks ahead. 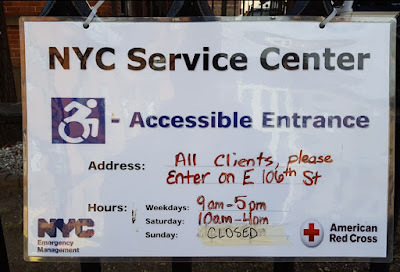 I really feel the Red Cross of the Greater New York Region was being so helpful to people who just went through a horrible experience and who needed so much. I look forward to serving again! Thank you Michael for sharing your experience and for your service! If you are a family or individual who has just arrived in NYC from a hurricane impacted area, please visit http://www1.nyc.gov/311 or call 311.